Mike Lauretano, Chairman of the Board of Lauretano Sign Group in Terryville, CT, was presented the Kirk L. Brimley Distinguished Service Award last night in Orlando, FL. The presentation was made in conjunction with ISA International Sign Expo 2014, the sign and visual communications industry’s largest gathering. The award is presented annually to a leader who has made significant contributions to the on-premise sign industry. Lauretano served as President of the National Electric Sign Association—a predecessor to the International Sign Association—in 1988 and has served multiple terms on the ISA Board of Directors. Currently, he serves on the Direct Member Steering Committee, which advises the Board. He also currently serves on the Board of Directors of the Northeast States Sign Association, an ISA-Affiliated Association. The Distinguished Service Award is presented annually as part of ISA International Sign Expo, honoring a member who has shown dedication and service to the on-premise sign industry for many years. ISA International Sign Expo is the sign industry’s largest trade show. The International Sign Association (ISA) represents manufacturers, suppliers, and users of on-premise signs and sign products from the United States and 60 countries around the world. ISA and its Affiliated Associations work to support, promote, and improve the worldwide sign industry. ISA International Sign Expo is the on-premise sign industry’s largest expo. Held each spring, the event features the latest products that showcase the breadth of the sign and visual communications industry along with education and networking events. 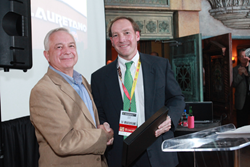 The 2013 event was named to the Trade Show News Network’s List of Top 250 Trade Shows. In 2012, ISA International Sign Expo was ranked in the Top 100 Largest Events by Trade Show Executive, its third consecutive year on the list. Learn more at http://www.signexpo.org.